While deadly tornadoes have already caused destruction in several states this year, intense lightning storms have also taken their toll throughout the United States. In fact, lightning strikes cost nearly $1 billion in insured losses in 2011, according to the Insurance Information Institute (I.I.I.). An analysis of homeowners insurance data by the I.I.I. 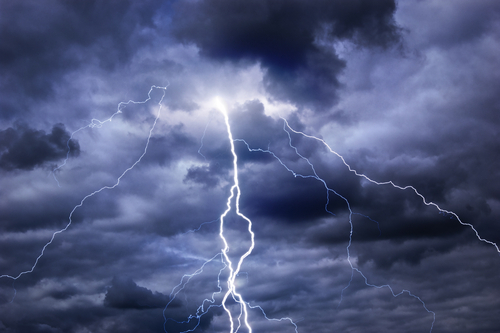 and State Farm found there were more than 186,000 lightning claims in 2011, down nearly 13 percent from 2010. The I.I.I. puts the average lightning claim at $5,112 in 2011, up 5.5 percent from 2010. The average cost per claim rose 93 percent from 2004-2011, even as the actual number of paid claims fell by over 33 percent over the seven-year period. This decline may be due to increased use of lightning protection systems. Another reason behind the increased claim costs may be due to a spike in consumer electronics prices. Product shortages in 2011 through the first quarter of 2012 from places such as Thailand and Japan, which were affected by supply chain issues, may have also contributed to the increased claim costs. According to the I.I.I., insured catastrophe losses in the United States for 2011 totaled $32.3 billion, greatly surpassing the average of $23.8 billion for the years 2000 to 2010. The federal government issued 99 disaster declarations in 2011, a record and an indication of the increased number of catastrophes, as well as a greater propensity to issue federal disaster declarations. According to Munich Re, a major reinsurance company, losses due to thunderstorms (including tornadoes, large hail and lightning) exceeded $25 billion last year, more than double previous records. Damage caused by lightning, such as fire, is covered by standard homeowners and business insurance policies. Some home and business insurance policies provide coverage for power surges that are the direct result of a lightning strike. There is also coverage for lightning damage under the optional comprehensive portion of an auto insurance policy.